LG is giving AV enthusiasts an early holiday present this year by announcing its next-gen image processor well-ahead of CES 2019. The processor, which goes by the name of Alpha A9 (Gen. 2), is touting a four-step noise-reduction algorithm similar to the one we saw on this year’s OLED lineup, an enhanced color correction algorithm and 120 fps High Frame Rate (HFR) support. It's worth pointing out that while HFR was available on the Alpha 9 processor, HFR content was only available via USB port, as LG has yet to adopt the HDMI 2.1 standard. Though, that might be something that changes in 2019. 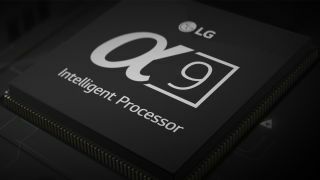 According to a blog post on LG’s website, the Alpha A9 (Gen. 2) will be powering at least part of LG’s 2019 OLED lineup – the still-unconfirmed LG C9, E9, G9 and W9 OLED models. If next year’s lineup mirrors the one from this year, the 2019 entry-level OLED will likely use this year’s processor instead of next year’s Alpha A9. Admittedly, a lot of what the Alpha A9 (Gen. 2) can do, this year's Alpha A9 can, too. And while that might mean that LG is running out of space to improve image quality from a processing perspective, it more likely means that the company is saving some key details of the processor's capabilities until CES 2019.